It’s a football cliché because it’s true: success in the game most often requires the club to develop a real sense of family forged through matches and road trips, through good times and tough. For three offensive-minded players on ANB Futbol, however, this family dynamic literally comes naturally. 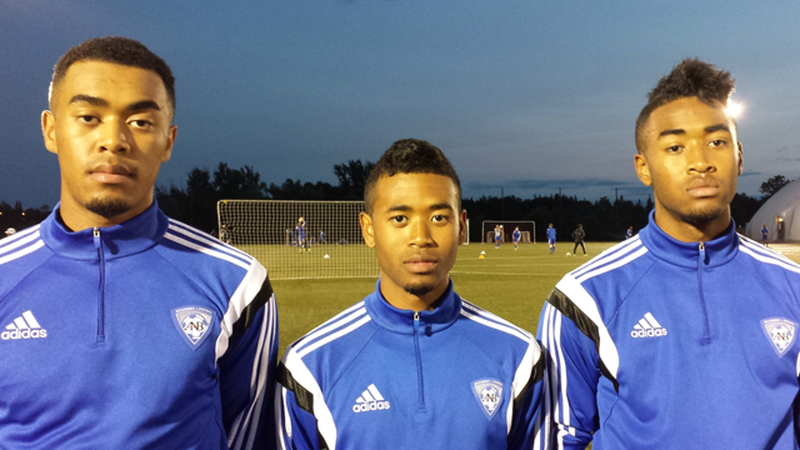 Brandon Mills, 22; Jason Mills, 21; and Jashua Mills, 18 are brothers, while Wayne Mills – their father – is the club’s assistant coach. The family lives together in Richmond Hill. While it's not new for the three of them to play competitively together, the dynamic of being in fixtures together on a semi-pro outfit is not something any of them take for granted. “To be honest it’s like a dream come true,” says Brandon. Jason, who both Brandon and Jashua claim to be the crème of the Mills crop and who has represented Canada internationally at the Under-20 level, sees their familiarity as a big advantage, especially in a brand new league like League1 where sides are often quite unaccustomed to each other. “It really gives me a sense of comfort to see Brandon and Josh out there with me,” Jason says. It has been a difficult season so far for the youthful ANB side, but the trio has started every game that they have been fit or not suspended for. With their athleticism, pace and aggressiveness, they have become players that opposition coaches have had to highlight. Nevertheless, the Mills’ dinner table conversation has not avoided the club’s inconsistency. “Yeah we talk about it at home,” Jashua says. “This year is more about development,” says a realistic Brandon. All the brothers are convinced that their father treats them no different than any other ANB player once they are at the park; while that may be true, his presence for them is clearly more than that of just any other coach. “Having my dad as a coach is unreal,” Jashua says. “Just knowing he’s there supporting us as a father figure and a coach really gives us a boost; we really feed off his passion,” Jason says. As the league moves through it’s inaugural year and beyond, mature, talented and well-mannered people like the Mills' boys are exactly the type of ambassadors that League1 needs to be a success.